By Girls. Fantasy Trashcan/True Panther Sounds. The San Francisco-based band Girls has been riding a wave of attention recently, making high marks with critics, getting coverage in Pitchfork and a cover story for Fader. This may also cause skeptics (like myself) to raise an eyebrow. The much-publicized early biography of the band's songwriter/vocalist, Christopher Owens (escaped from a religious cult, kicked around the streets of Texas, mentored by an eccentric millionaire, moved to SF, started a band with his then-girlfriend called The Curls and eventually teamed up with sound engineer and closet instrumentalist Chet "JR" White to form Girls) has nearly overshadowed the band's accomplishment in delivering a truly impressive debut recording, Album. It's a debut with a potpourri of pop influences, ranging from 1950s rockabilly, to 1960s Brill Building/ Phil Spector pop, to bubblegum to prog to My Bloody Valentine. 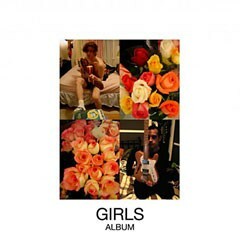 What makes Girls unique is how the influences are sorted and blended in each song. In this respect, Girls seem to be carrying the flag once carried by Guided By Voices. If Owens (who supposedly writes about three songs per week) is the band's Bob Pollard, then JR White is the band's Tobin Sprout, creating the proper arrangement and sound to accompany Owens' catchy pop melodies. However, Girls show more focus in their debut than Pollard could ever achieve with a full-length offering. And even though there are "lo-fi," or raw, elements in the mix (and recording), the sound is deceptively simple, while the instrumentation is precise, yet skating close to becoming unhinged. In attitude, execution and variety Album follows in the footsteps of bands like The Replacements and Yo La Tengo. A Phil Spector/Ronettes-like beat and percussion drives "Ghost Mouth," with Owens, like Replacements' frontman Paul Westerberg, sounding both weary and nostalgic when he heartbrokenly sings, "I'm a ghost man/ in a ghost town/ and I just wish I could get out/ and get into heaven." Owens' narratives are often preoccupied with heartbreak and hopelessness. "Hellhole Ratface" is surprisingly epic, balancing the right elements of Brian Wilson-esque percussion and arrangement, a hook-filled chorus and industrial textures (including a heavy MBV Kevin Shields-like wall-of-guitars) that would make Animal Collective's Panda Bear envious. And the band's closing of Album with two songs, one leading into the other, is brilliant. "Curls," an instrumental with an eccentric mix of Cramps/Gun Club-influenced swamp garage with ’70s British folk/Nick Drake touches, acts as an introduction to the fuller, more expansive "Darling," with its addition of Owens' bouncy pop melody and White's excellent lead guitar lines. Unfortunately, such a strong debut may lead to great expectations down the road for this talented duo. For the present, there is the excitement in watching these rookies tear it up and achieve something beyond prior expectations (if any). Album illustrates how disparate collisions of music and creativity can result in imaginative and pleasing work.